This handmade paper artwork is "painted" completely with pigmented cotton pulp on top of a base sheet made from cotton and flax. The entire process, from forming the base sheet to painting my image, is done at the same time while all the fibers are wet. The fiber used for my base sheet is a combination of cotton rag (from recycled t-shirts) and flax (which I cook down from the raw plant fiber). All the fibers are pulped in a Hollander beater. Once the pulp is formed into a sheet, I place a series of mylar stencils on top of the still wet sheet. I spray finely beaten cotton pulp, pigmented various shades, onto my base sheet. After the sheet is pressed and dried, the result is this sheet of unique paper, where the image itself is part of the paper fiber. Even though I use the same stenciled images multiple times, each sheet I create is unique, based on variations of sheet formation and pulp painting. "Fertility" continues my Crow Divination Series of pulp-painted crows. 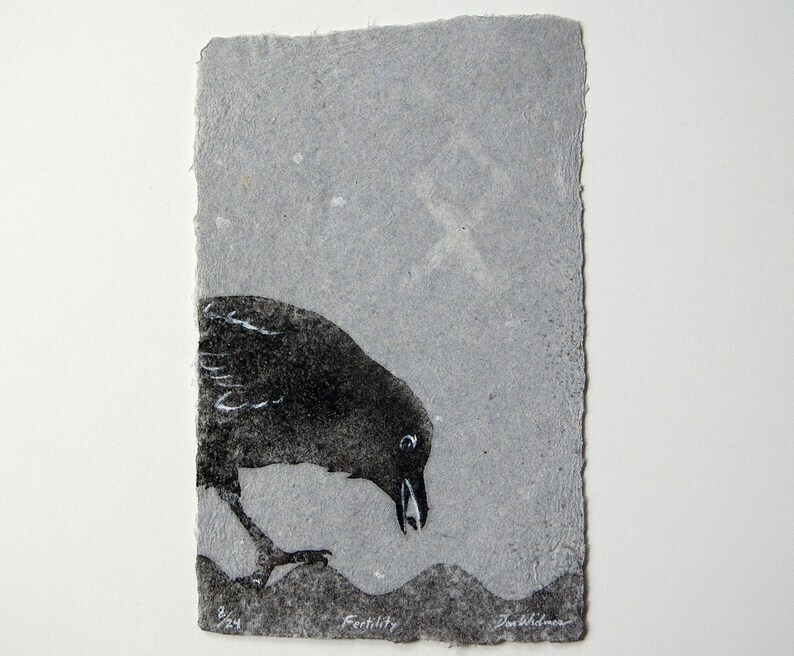 In many cultures and mythologies, ravens and crows represent messages from the divine. In Norse mythology, the god Odin had a pair of ravens who would bring him information. I have partnered the crow image with a watermark of a Viking rune, which will appear in the lower right corner of the sheet (behind the blades of grass) when the sheet is backlit (see the last image). Each rune is imbued with a particular meaning. In this piece, the rune "Inguz", meaning fertility, is revealed. The rune represents new beginnings and would be appropriate to celebrate any fruitful endeavor, such as starting a new job or welcoming a new addition to the family. I will create a limited number of each design in my rune series. Each of the 24 rune designs will only be produced 24 times. If you decide to frame this artwork, consider using a float frame, which can be hung in front of a window or other light source. The handmade paper is translucent and will reveal the watermark when lit from behind. The pigmented color in the artwork is considered light-safe. This piece comes with a one-sheet description of the artwork. The artwork itself is signed by the artist. Created in Bridgeport (Chicago), April 2019. Size: 8.75 x 5.5 inches (approximate); 22 x 14 cm.